One of the greatest challenges of dog training is keeping the pooch focused on the lesson — and on the person in charge. The good news is that for dogs, focus and joy frequently coincide: The more fun your dog has while training, the more likely he will remain focused on you. Here are five simple ways to build your dog’s focus during training — and have fun while you’re doing it! Emphasize the positive. 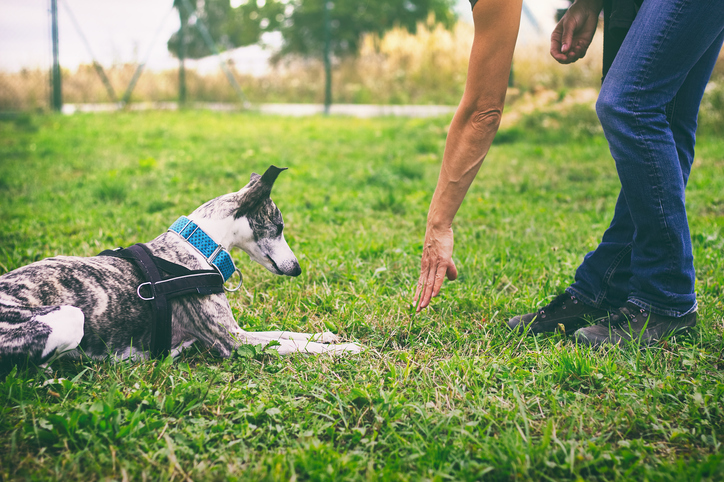 Reward-based training builds your dog’s confidence by offering positive reinforcement for the behaviors he does right, rather than punishing him when he makes a mistake. Work at the right pace. Look for ways to structure your training so that your dog remains successful — and focused — the majority of the time. I use a five-trial ratio: If a dog can succeed at a desired behavior three out of five times, then he should continue at that pace. If he is only doing the behavior once or twice in every five trials, it might be time to back off and start over. If he is able to do the desired behavior four or five times out of five, it’s time to make training more difficult. Add distractions early. Once a dog has mastered a behavior, incorporate distractions before adding other requirements, like performing the behavior for long periods of time or at a distance. For instance, when training stay, first teach the stay, and then add distractions with increasing intensity as long as the dog remains successful. Once he is able to deal with the distractions, then add additional challenges, like distance work. Vary the reward. It’s important to reward your dog for his successes; a rate of 10 treats per minute will help keep your dog on task. Frequently vary the type of treats you offer, to make things interesting. Nonfood rewards should also be varied; for example, alternate toys to keep play exciting. Incorporating chase and fast movements into your dog’s training also holds his attention — you become the squirrel, which gives you a better chance of competing with distractions in the environment. Keep training short. Your dog will find it easier to stay focused if you train with several short sessions throughout the day, rather than one long session. Training can last anywhere from one minute to 10 minutes, depending on the dog. End your training exercises while your dog is still interested in what you’re teaching him. One last tip: Be sure that you keep yourself focused during training sessions. Give your dog your full attention and be ready to notice and reward the good choices your pet makes. Remove distractions like TVs, phones and other people while you’re training. Being fully present can help strengthen the bond you share with your dog — and that’s the most important part of any training session.